1400-1-OK-AA Features: -Sturdy mixed hardwood frame. -Official Collegiate Patch. -Recessed curves on both sides for "Air Holes". -Recommended for children ages 4 and up. -Lid features a safety hinge. -Weight capacity: 75 lbs. Country of Manufacture: -United States. Product Type: -Toy storage bench. Fabric Color: -Black/Red. Frame Material: -Wood. Fabric Material: -Polyester/Polyester blend. Dimensions: Overall Height - Top to Bottom: -16". Overall Width - Side to Side: -23". Overall Depth - Front to Back: -20". Overall Product Weight: -37 lbs. 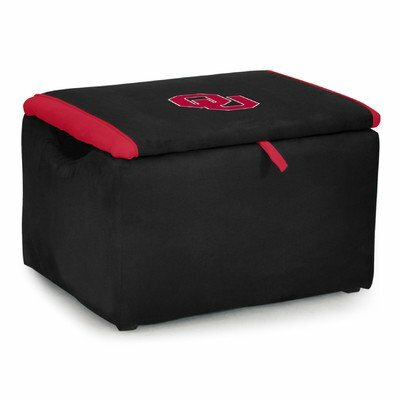 Padded lid and constructed with a sturdy wooden frame. Safety hinge and recessed curves on both sides for air holes. All inside surfaces and bottom surface are covered in black upholstery fabric. Dimensions: 16"h x 23"w x 20"d ages: 4+.